Bring a versatile seating option to your cozy country kitchen with the Amish Wooden Bar Stool with Swivel. Perfect for your kitchen counter or bar, these swivel stools provide space saving beauties for large or small areas. With no chair back to consider, these Amish made bar stools tuck neatly underneath the counter when not in use. The turned legs add a decorative appeal to these swivel bar stools. Customize these stools in your choice of oak, cherry or maple wood. Three height selections are available to fit your counter best. A wooden swivel bar stool allows you to move a bit while you sit which is a natural impulse after sitting for awhile. The swivel allows you to reach for things more comfortably with its gliding movement. 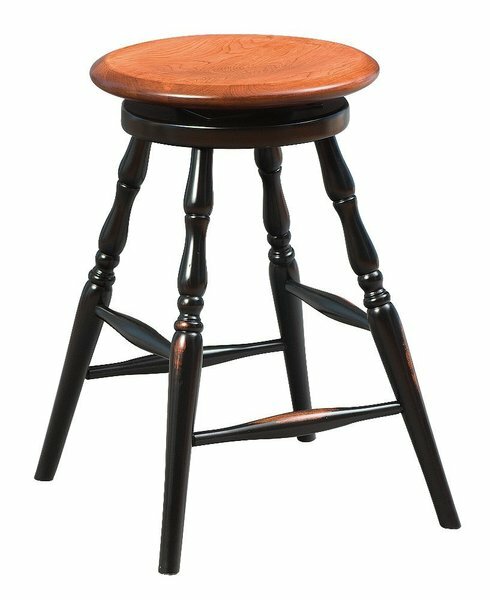 Take a look at the wide variety we offer in our collection of Amish Bar Stools and Counter Chairs. Be sure to review our solid wood Amish Home Bars to use with your custom made bar stools.